Oh Samsung...methinks thou doth try too much*. The company has walked in Apple's shadow doggedly trying to match its rival's every step for years now, but its latest effort is sooooooooo bad, it goes straight past pathetic to embarrassingly sad. 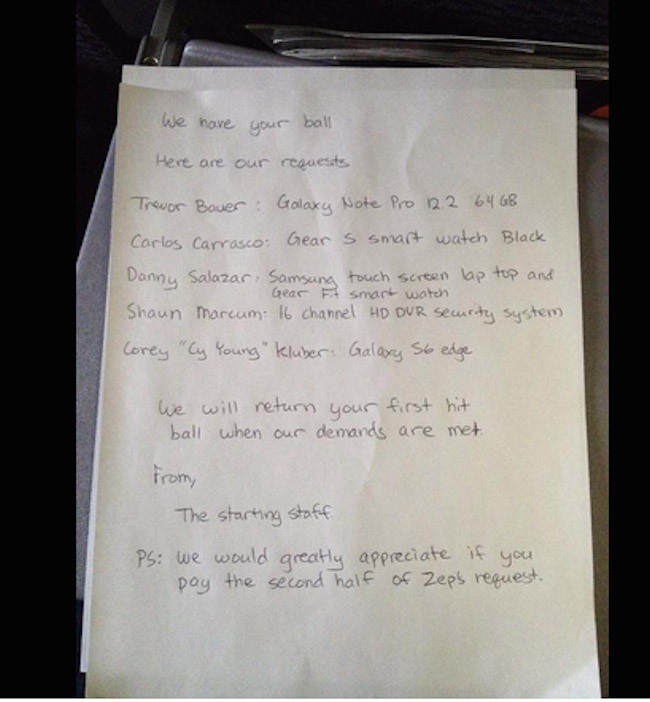 You might remember the Cleveland Indians holding Brandon Moss's 100th home run ball hostage as a prank. Their demands included iPads, iPhones, Apple Watches, and Macs. "You get the ball when we get these items." 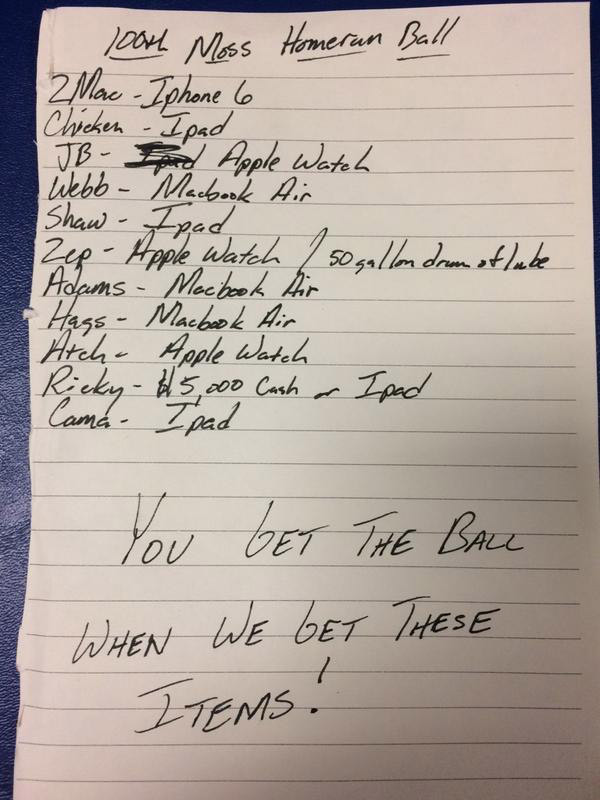 My favorite was the "$5000 Cash or Ipad [sic]." Pro Tip: You can buy several iPads with US$5,000, so stick with that. Anyhoo, Apple CEO Tim Cook mentioned this ransom note during last week's World Wide Developer Conference keynote address, saying that Apple was going to pay it for the slugger. It was a cute moment. Funny. Endearing. And it got a laugh. Enter Samsung. Or maybe it was truly the "starting staff" and pitcher Trevor Bauer of the Indians who wanted to get in on the action. But boy, it sure smacks of a hamfisted PR move by a company desperate for the world to think it's relevant. Either way, we have a Samsung-drenched sequel targeting Francisco Lindor, a rookie for the Indians Fox Sports called a "top prospect" [Via The Loop > Dan Frakes]. Mr. Lindor hit his first single in Major League Baseball on Sunday as a designated hitter. A ransom note signed by "The Starting Staff" then surfaced where that staff demanded curiously specific Smasung items. So carefully laid out. Identifying nicknames provided in convenient quotes. Those curiously specific product names and sizes. Is this a case of spontaneous bandwagon jumping from a Samsung fan or a (badly) crafted PR stunt? My old friend Occam's Razor points to the latter. Either way, its unfunny. Wait, I take that back. The P.S. is pretty funny. It refers to Marc Rzepczynski's line item request for either an Apple Watch or a 50-gallon drum of lube. Apple CEO Tim Cook said he was supplying only the Apple items. In fact, Apple photoshopped the reference to the lube out of the photo of the ransom shown on the WWDC Keynote screen. So the P.S. is amusing, but there's still an acronym for the whole thing. SMH. *With apologies to The Bard, as ever.